I’m a child of the eighties born into the western developed world and named after a ridiculous pop star with a regrettable haircut. This means that in my lifetime I will eat about two and a half tonnes of chicken, perhaps the same amount of beef (though hopefully less). I’ll drink around 15 thousand beers (that’s probably too modest, I’m British). I’ll brush my teeth with one hundred and fifty toothbrushes and I’ll sing horribly in about thirty thousand showers sending 2.6 million litres of water down a drain. Njile, Gunga and Tabu are Hadzabe. This means they won’t. My life allows me on occasion to wander way off the beaten path and I’ve shared in adventures and experiences that I would never have dreamed of at the cusp of my twenties in the UK. Wildlife, conservation, Africa’s wilderness and biodiversity represent not only the great love of my life but also my career, my dreams and aspirations. Yet regardless of these robust green-leanings the fact remains that in my first year on the planet, my new-fangled disposable nappies alone created a greater carbon footprint than Njile will in his entire lifetime. 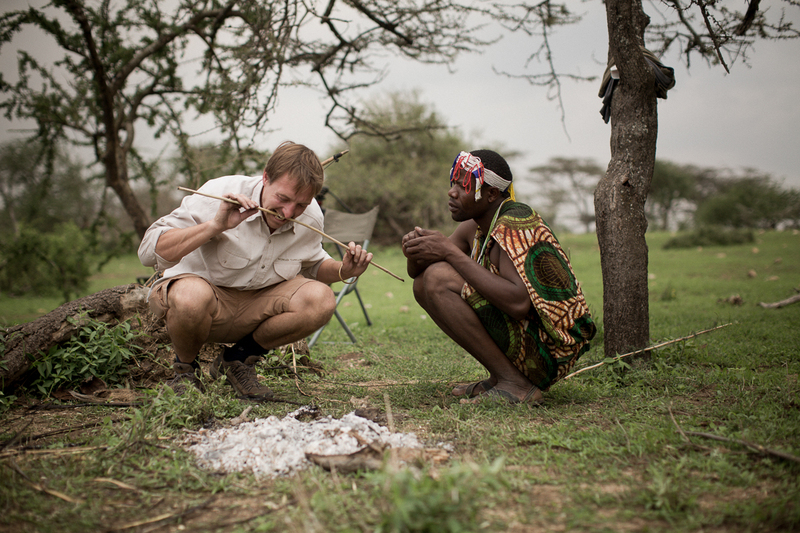 Perhaps it was the discomfort of this reality that made me nervous when first approaching Njile, Gunga and Tabu, asking them if they would spend two or three days with me, in their ancestral lands, teaching me how to make a Hadza bow and arrows from start to finish. 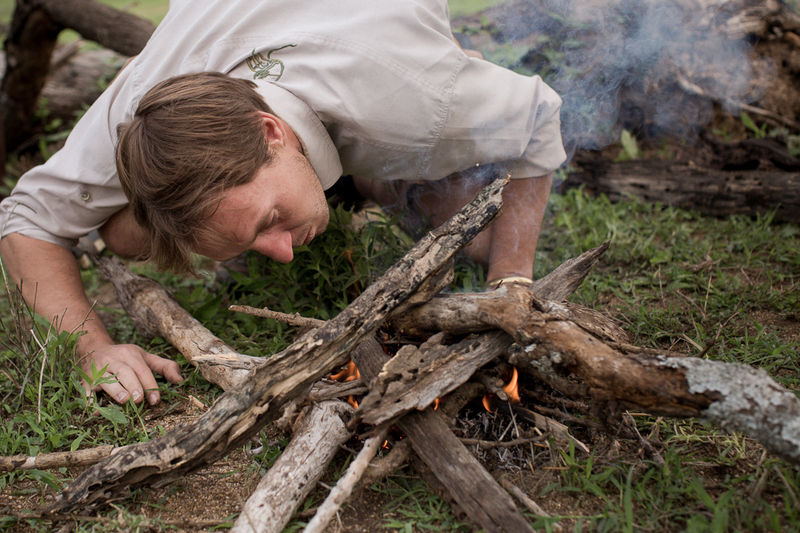 I’ve been dreaming of learning bush-craft first hand from people that use it in their daily lives since I was a school boy. These three are rock stars when it comes to this kind of stuff and to be honest I think that’s why I felt bashful. 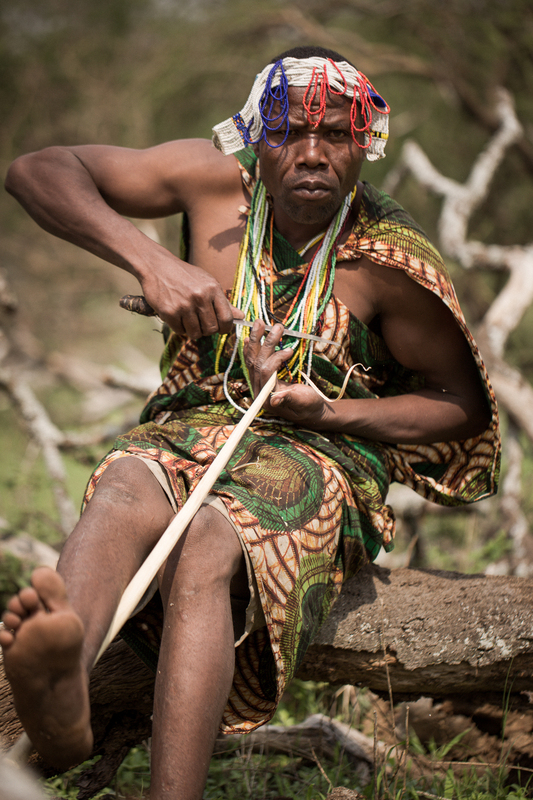 The Hadza are an indigenous ethnic group from North Central Tanzania, they speak with a captivating lilt and a percussive clicking tongue that I love. 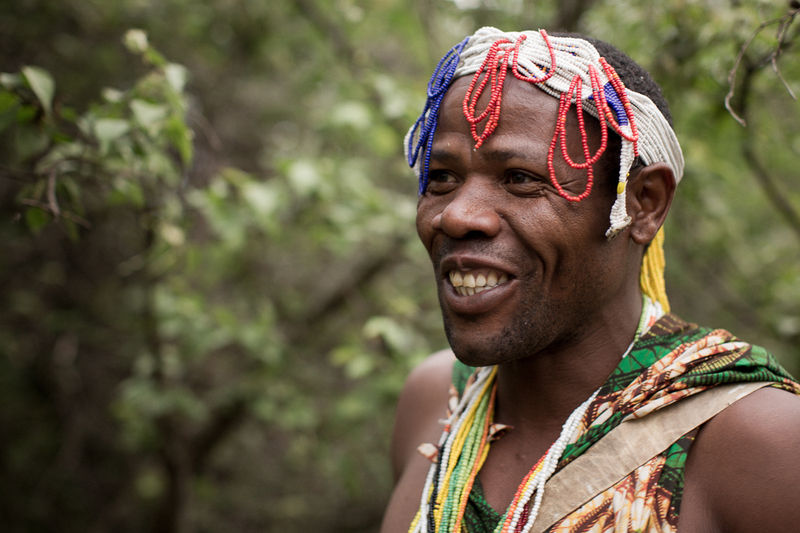 Though they bear several lifestyle similarities to the San and Khomani “bushman” tribes of southern Africa, there is no evidence that they are in any way related. 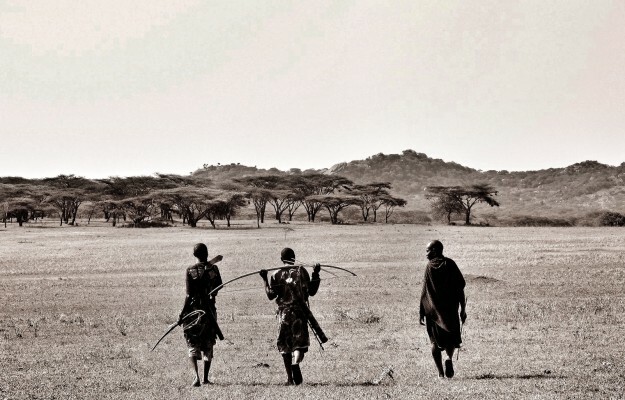 There are about one thousand three hundred Hadzabe in Tanzania and of these some seven hundred, Njile, Gunga and Tabu included, live an entirely traditional life. A purest, hunter-gatherer existence that paleoanthropologists agree has been practised by this tribe and their ancestors, in this very place, for tens of thousands of years. The Hadza land is just fifty kilometres from Olduvai Gorge, what we dramatically refer to as the “Cradle of Mankind”, it would be reasonable to consider it more their cradle than anyone else’s left on our planet. 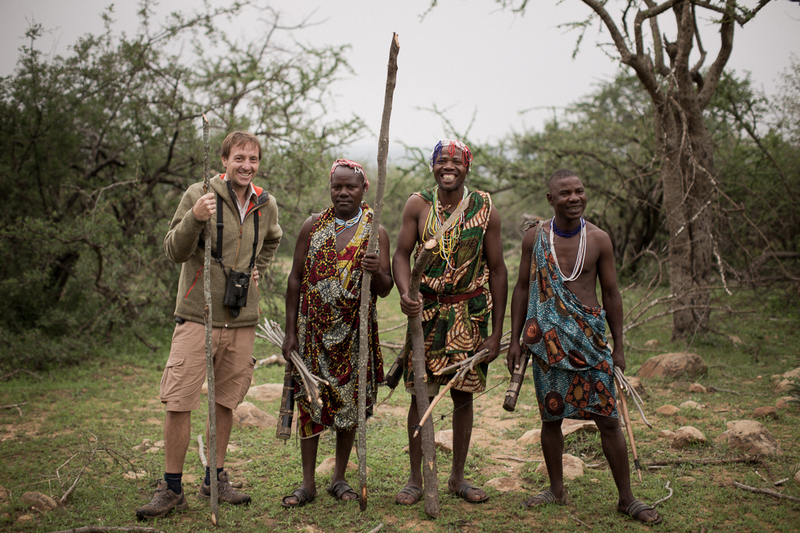 My three companions took me to camp in a clearing within Comiphora woodland, up on the plateaux to the North West of Lake Eyasi. The spot was perfect, we had a bubbling stream behind us with crystal water, to keep the pathetic Englishman hydrated, and all the various plants I would use for the task at hand. 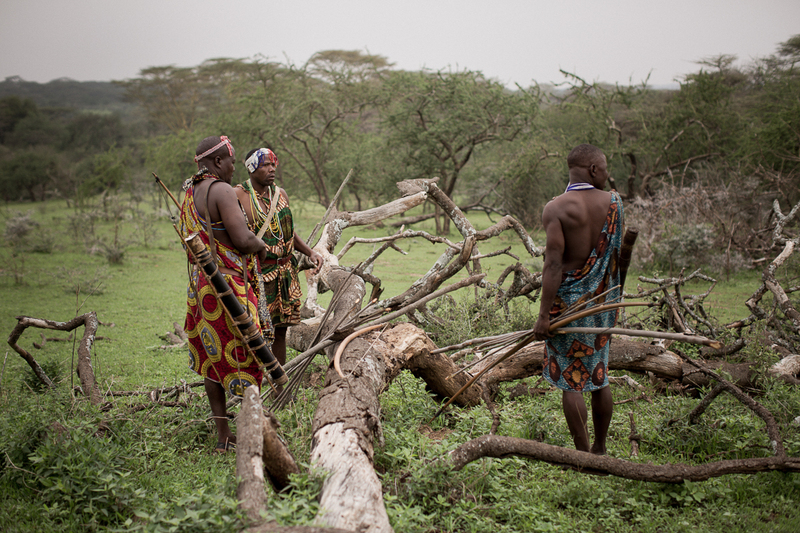 Njile showed me how to choose an ideal branch from a Grewia tree for the bow itself. He showed me how to roast, skin and straighten the arrows using my teeth as a vice. He showed me how to perfect the finish by rolling the arrow up and down my calf while running a blade along the shaft (this made me yelp a bit as it pulled all the hairs out of my left leg). 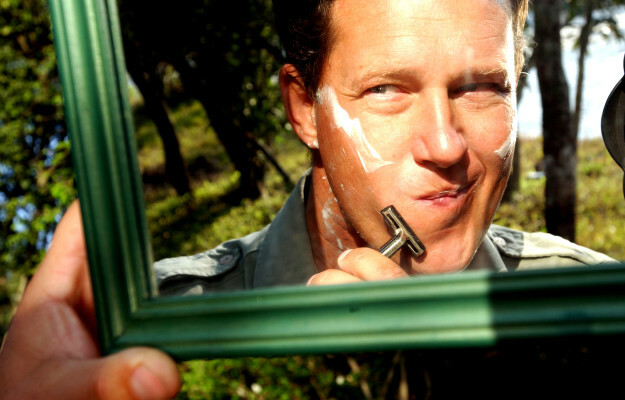 He found me feathers from a Magpie Shrike to fletch the arrow and taught me how to pull and plat fibres from the branch of a Lanea tree to make the string, though they would have preferred to use tendon from a vanquished Zebra. It took two and a half days and I’d never have come close to finishing without their constant help and guidance. It was fabulous. I’ll let the pictures tell the rest of the story, I’ve waffled on a bit much here. 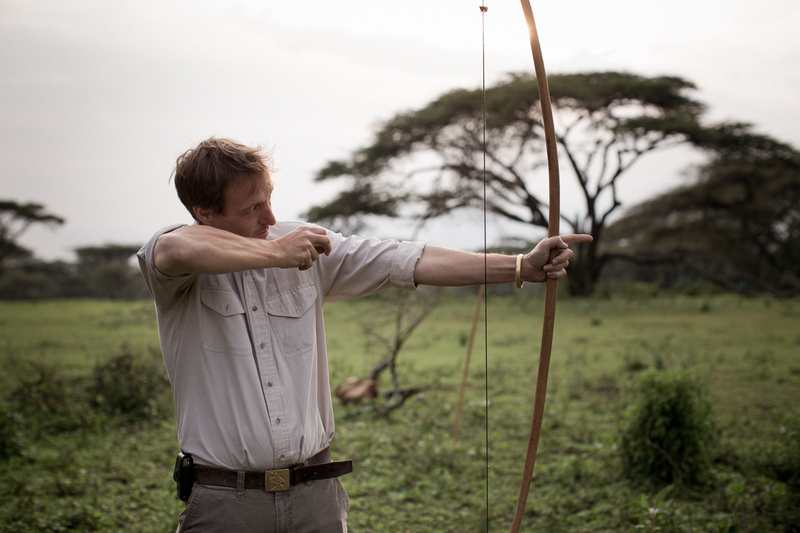 When I finally got to shoot the thing at the trunk of an acacia I didn’t embarrass myself too much. In fact, I nailed it. I shot the sharpened stick into that hard stem from ten meters and felt like Robin Hood as I bellowed, “bloody hell this thing will put some holes in ya!”. My three companions laughed.